Here at Londonist we're big fans of the 'Don't know what you want? Have it all!' approach to restaurant ordering, which is precisely what makes a great seafood platter hard to beat. Good ol' fish and chips may have long had a stronghold in the capital, but if you want to give your seafood snacking a serious upgrade, opt for one of London's finest fishy feasts instead. You can expect to shell out (sorry) a pretty penny for spreads of high calibre, but the expense will soon be forgotten somewhere between cracking crab legs, grappling with langoustines and slurping oysters. Enjoy. Serving an alternative seafood spread, Rasa W1 combines the best of its fish-focussed starters into one, handy platter. Specialising in Kerala cuisine (a southern Indian state), Keralan dishes are often heavily spiced, served on banana leaves and eaten exclusively with your right hand. Only the former applies here though, with fragrant dishes packed full of flavour, aroma and colour. On the seafood platter, the crab thoran reigns supreme. The chef inherited the recipe from his grandmother and sees fresh crabmeat combined with coconut, mustard seeds and ginger, before being fried in a close-lidded plan to lock in all those delicious juices. Devour it alongside the platter's other components: marinated kingfish and chilli-laden king prawns. It's a marvellous introduction to the freshness of Keralan cuisine and a steal at less than £14. In the heart of the West End, J Sheekey never disappoints as a pre- or post-theatre indulgence (heck, why not both?!). Glamorous yet friendly, atmospheric yet tranquil, it is a soothing antidote to the manic bustle of the streets outside. 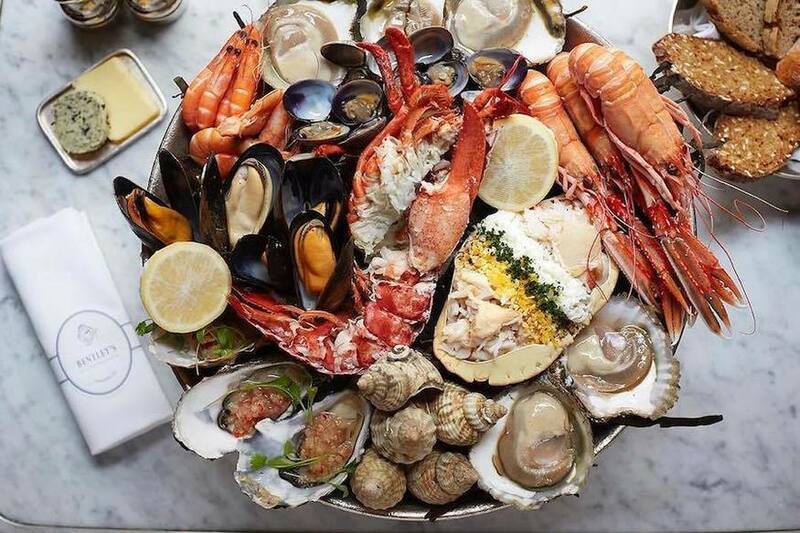 You'll want to take your time when it comes to the seafood platter though (or as it's impressively named on the menu: Plateau de Fruits de Mer, darling), laden as it is with a veritable mountain of sea-dwelling goodies. Work your way through two tiers of scallops, oysters, shrimps, crab, mussles, clams, cockles, whelks... the list goes on (and depends on what's in season). It's a head-turner for sure, so expect a few gawps from fellow patrons and rein in your smugness as you get stuck into this pure treat. For mere swank-factor, Scott's tops the list. 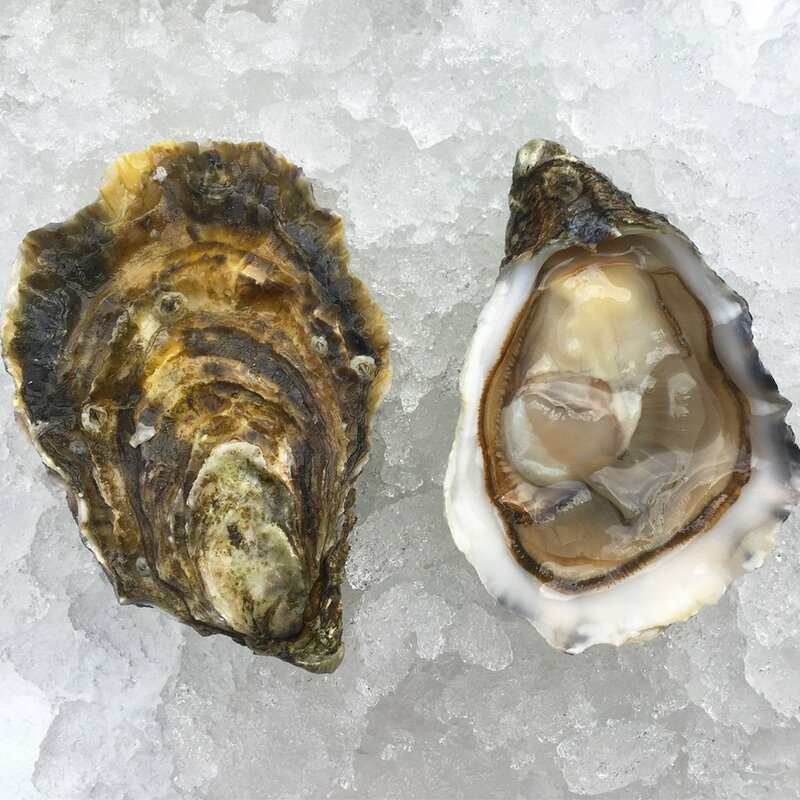 We're talking about oysters on ice in Mayfair for heaven's sake. Londonist's Helen Graves once noted that "everyone in this restaurant is beautiful and thin, sucking back oysters and champagne like they're going out of fashion" and we can't say much has changed since then. But its extravagance is met with warm service and truly excellent seafood. It's clear why loyal customers keep returning, and the charming wait staff seem to know half the patrons by name. The Fruits de Mer platter is shellfish heaven, heaped with cockles, prawn, langoustines and some more creative treats such as scallop ceviche. If you're in the mood for a hot dinner, the roasted shellfish platter is a fine alternative. It's decadent and high-end, but there's a more than willing audience ready to pay the price. The Wright Bros. chain is a firm favourite of ours, with each of their five London outlets (Borough, Soho, Spitalfields, South Kensington and the newly opened Battersea) serving seafood of a consistently high quality. Whet your appetite with the oyster happy hour from 3-6pm every day (£1 each!) before delving into the piece de resistance: a full-blown Fruits de Mer platter. Now, there are options here. Platters of individual shellfish such as prawns, razor clams, mussels, whelks, langoustines and crab are available if you just want to tuck into your favourite. You can build your own platters too. But we recommend one of Wright Brothers' own mixed shellfish platters, available in House (read: massive), Full House (read: really massive) or Deluxe (read: positively gargantuan) which combine the best of everything on offer. Whichever you choose it is a lot of food, so note your appetite and make your choice wisely. This is food too good to waste. You don't reach 100 years in business unless you're doing something seriously right. In Bentley's case, it's doing a whole lot of things right and most of them can be enjoyed by delving into the sharing platters. Three are on the menu: Seashore Platter (featuring oysters, mussels, whelks, crevettes, clams and cockles), Hot Platter (prawns, scallops, whelks, mussels, crab and lobster) and finally the suitably-named Royal Platter, which comes with oysters, langoustines, dressed crab and lobster. All ingredients are superbly fresh and cooked to perfection thanks to the watchful eye of head chef, Richard Corrigan. It's all very well-to-do – a flute of champagne here, a dozen oysters there – but the restaurant's upmarket ambience doesn't mean there's any scrimping. The platters are plentiful – ideal for two to share – and best enjoyed on the street-side terrace when weather permits. While seafood platters are, in the main, high-brow affairs with the price tag to match, North Sea Fish near Tavistock Place in Bloomsbury is doing things a little differently. This much-loved chippy is firmly holding onto its battered roots and offering a supersized fish and chip supper. Fried cod, haddock AND plaice (yep, that's three different types of battered fish) arrive alongside sardines, calamari, scampi and the obligatory chips. It's a monster of a dish, a steal at £15.95, and while batter features heavily, it remains light enough to ensure the flavour of the fish remains centre stage. The restaurant itself is cosy and friendly (they're more than happy to wrap up any leftovers for you to take home). What's more, you can get the platter to takeaway too, ensuring maximum seafood gorging in the privacy of your own home. Bliss. Wapping High Street may not immediately spring to mind as a location for high-end seafood dining, but turn your nose up and you'll only be missing out. Smith's of Wapping boasts white tablecloths, sweeping river views and one of the finest shellfish platters to be found in London. Not only is the assortment of oysters, crabs, king prawns, mussels, cockles, clams and prawns a feast for the stomach, it's also a feast for the eyes. The giant dish arrives with every single piece of shellfish masterfully tesselated, tidbits blossoming out from the centre like some sort of exotic seafood flower. It's almost too good to dig in. Almost. Once you do, you'll be absorbed by the high quality and freshness of the ingredients. Combined with the view of Tower Bridge at sunset, it's an impressive date night choice. A dazzlingly beautiful, art deco restaurant in one of London's most prestigous hotels, a seafood platter at Kaspar's in The Savoy is one hell of a treat. The restaurant's motto is "Not bound by the seasons, but inspired by them" so you can be assured of mightily fresh seafood, prepared and presented with finesse. If you're going all-in, the 'Best of the Seas' platter is a must. Share it as a starter or devour one all to yourself for a main course. Native oysters, king crab, prawns, mussels and Aruga caviar all usually make an appearance. As you'd expect from such a renowned establishment, the service is expertly attentive and they will try to substitute any items not to your taste. It's not the largest offering on this list, but the setting and food quality combined make it the utmost in refinement. Both a steakhouse and a New York import, you should already know that Smith & Wollensky don't do things by half. The portions are big, the flavours are bold and the seafood platter is stunningly presented, heaped with lobster, crab meat, shrimps, oysters, clams and a range of complementary sauces. Available as either a starter or a main course to share, all components on the platter come served over ice and fresh-as-you-like. It's the star of the show and combined with impeccable service (get the staff to recommend you an accompanying bottle of wine, they have a knack for it) and an extremely laid back vibe, this one of for those who want all the juicy sea goods, but without having to iron their best shirt for it.